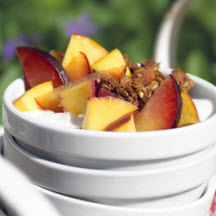 Place half of the fruit in the bottom of a parfait glass; top with half of the yogurt and half of the granola. Repeat layer. *About 1 to 2 peaches or nectarines or 2 to 4 plums. Nutritional Information Per Serving (1 recipe): Calories: 360; Total Fat: 5g; Cholesterol: 6mg; Total Carbs: 74g; Fiber: 6g; Protein: 12g; Sodium: 171mg. Recipe and photograph courtesy of California Tree Fruit Agreement.